Ruminants are unlike other livestock thanks to their ability to turn fiber into meat and milk. Fiber is the part of the plant that gives it support and rigidity, and it is often quantified by neutral detergent fiber (NDF). The potentially digestible portion (pdNDF) is quantified by subtracting uNDF240, the undigestible portion after 240 hours, from NDF. “uNDF240 is related to physical effectiveness and gut fill,” says Michael Miller, a research technician at the Miner Agricultural Research Institute in Chazy, N.Y. He addressed the effect that fiber has on feeding behavior in the Miner Institute’s Farm Report newsletter. To better explain the relationships between the different quantifications of fiber, Miller compared three studies that were completed at the Miner Institute focused on diets consisting of different particle sizes and digestibility. The results are summarized in the table below. Intake had a strong, negative relationship with uNDF240. This means that as uNDF240 went down, the cows tended to eat more feed. Since uNDF240 is undigestible, it just passes through the rumen and takes up space. A lower uNDF240 would mean that the fiber present is more digestible, so it passes through the rumen faster. Meal time also had a positive relationship with uNDF240. Essentially, this means that the higher uNDF240, the longer an animal eats. “This is important as cows that are limited by time such as being overstocked or being away from the pen for long periods of time should have diets lower in uNDF240 to allow for shorter meals,” Miller explains. In regards to pdNDF, meal bouts had a strong positive relationship; a raise in pdNDF led to more meals. “So, as a cow comes to the feedbunk for the first meals, she will fill up, lay down, and ruminate,” Miller elaborates. “The cow will come back for another meal after a part of the rumen has emptied,” he adds. By formulating diets with lower uNDF240 and higher pdNDF, optimal intake for efficient production can be met through more quick meals. “Broadening our knowledge of how fiber fractions influence intake and meal behaviors will allow us to formulate diets that match management styles,” Miller states. For example, since uNDF240 influences meal duration and pdNDF influences meal frequency, a diet with low uNDF240 and high pdNDF would be ideal for cows short on time to eat. 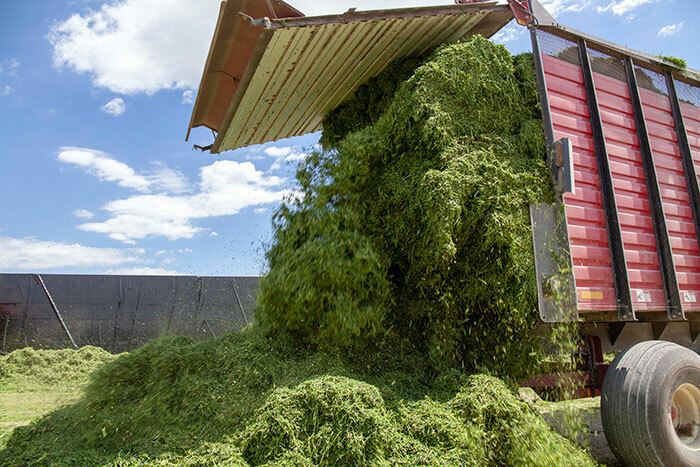 According to Miller, this can be achieved through high-quality forages and some assistance from by-products.